Weeks ago, I got an sms from Mr. Randy Urlanda of Manila Bulletin inviting me to the foundation day of Mamburao, the capital of Occidental Mindoro. I have been hearing about the municipality, together with Sablayan, as the rising tuna capitals of the country. Well, of course I said yes. Who says no to free trips? Oh wait, I know. So, anyway, we agreed to take the 1AM bus to Batangas Port last Friday. Mamburao can be reached via Roll-On Roll-Off (RORO) vessels plying from Batangas Port to Abra de Ilog. From the Abra de Ilog Port, there are vans going to Mamburao, which is less than an hour travel from the port. We took the 4AM RORO to Abra de Ilog. It was a beautiful night to sail. The beauty of the full moon and the rising sun kept us awake. We arrived at dawn at the Port of Abra de Ilog, the northern gateway to the province of Occidental Mindoro. The municipality of Mamburao arranged for a van to pick us up at the port. This was our first view of the Mindoro Strait, the new tuna highway. Starting in 2008, Mamburao and Sablayan have become the major suppliers of tuna where most tuna being exported by the Philippines to Japan, Korea, Australia and European countries come from. The two towns have benefited from the changing behavioral patterns of tuna, which they sustain by deciding to adopt sustainable fishing methods. I first heard about this from Chef Paolo Nesi of the L'Opera group when they opened Prego, an Italian Restaurant at City of Dreams. Chef Nesi explained that tuna fishes that were caught individually remain intact, hardly have any bruises on their bodies and taste better. Fishermen here use the traditional hook, line and sinker method. As a result, both the World Wildlife Fund and the Bureau of Fisheries and Aquatic Resources commend the towns and suggest them as role models to sustain fish population in the seas. You read that right. Fresh fish balls. After our much needed sleep, we decided to explore the town to look for Mang Edgar, who has been featured on television because of his fresh fish balls. Being a fish ball fan, I couldn't resist. 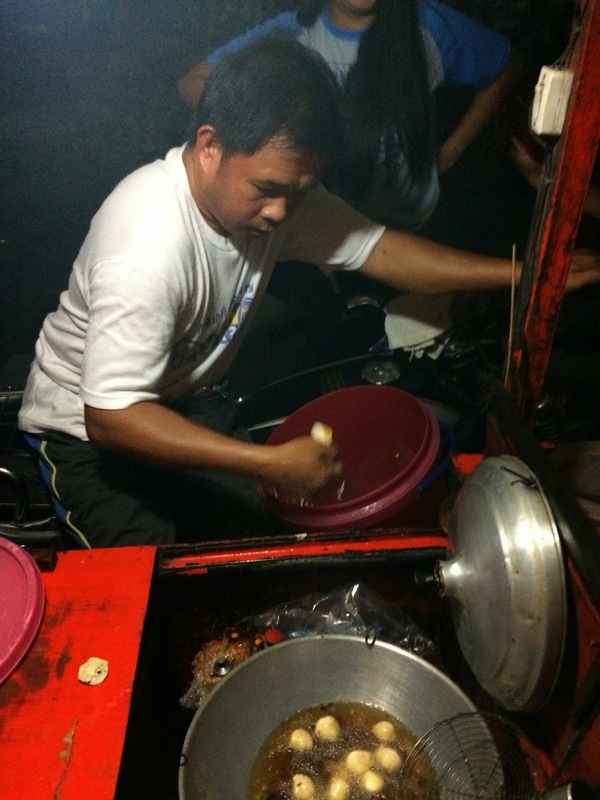 After three tricycle rides, as our first two did not know Mang Edgar, just when we were about to give up and just have dinner with the rest of the group, we found him. 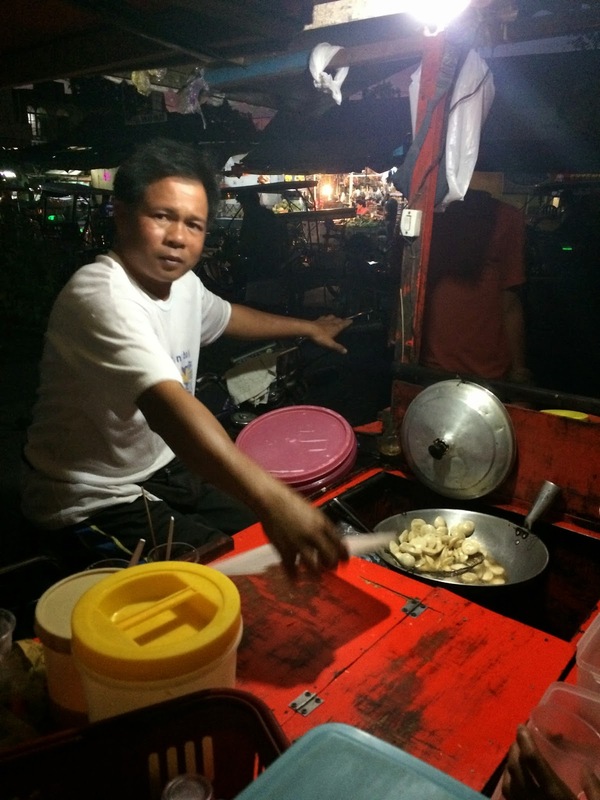 Say hello to Mang Edgar and his fresh fish balls. 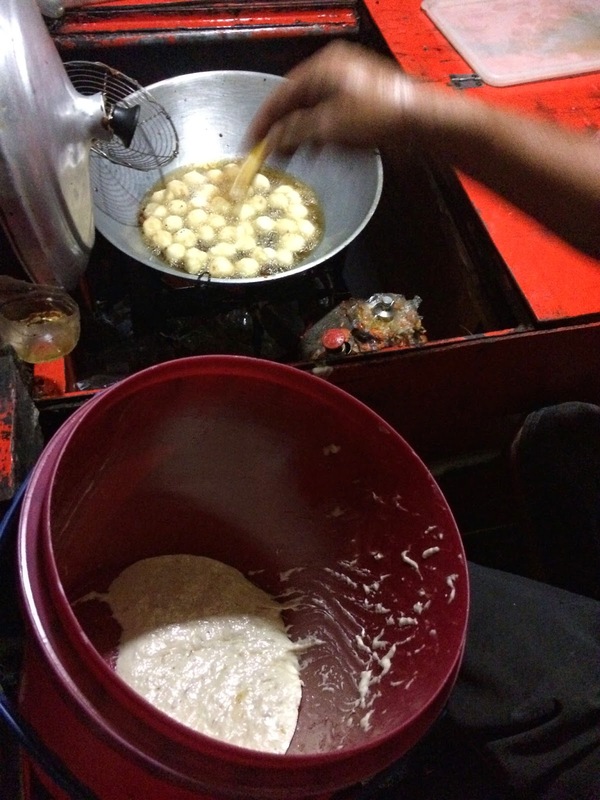 Most of us know how frozen fish balls taste like, which most fish ball vendors use. Mang Edgar's doesn't have much of the fishy and salty taste. It is crispy and yes, fresh. He also has that popular manong fish ball sauce I like. Day 1 was a success! The highlight of our visit is the Tuna-tonelada Festival. Before coming to Mamburao, we watched the feature of Living Asia Channel, so we were excited. The tuna float parade started promptly at 7:00 AM. Schools, government offices and other stakeholders joined. There were not much people on the street to watch the parade so we had good vantage points. What's a tuna parade without tuna? Of course, the stars of the parade were the tuna. We actually thought there would be none because it was a full moon, which makes them difficult to catch. But, they were there. Yes, Mamburao has a good stake on the claim as the new tuna capital. After the parade, we went to the town's function hall to watch the performances. The kids were much livelier this time and they did well in their well-choreographed dance numbers. 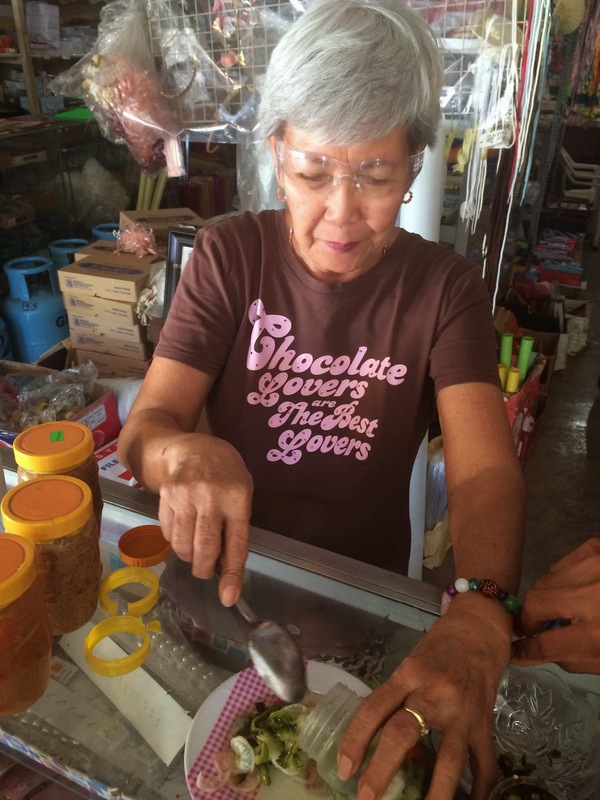 According to Mamburao's former tourism officer, Ms. Elma Tejada, who conceptualized the festival, it was much grander during its early years, with the parade culminating in a cook fest where guests get to partake of the town's best tuna fishes. In the festival schedule we got hold of, there was supposed to be a cook fest at 3:00 PM, which we failed to see. We did, however, partied with the good people of Mamburao at their mardi gras. There, we had our kilawin and grilled tuna. The group we were with wanted a night cap at Jopay's. One of my secret bucket list wish is to drink at a sleazy bar. No way am I doing it in Manila or any other places where a lot of people know me. Fulfilled! When we got there, they actually had good music playing. I must admit, I enjoyed their music more than the band playing at the town's mardi gras. It was the perfect night cap. The band played most of our request and we had cold bottles of my favorite San Miguel Beer. Any day or any time is a good time to go the beach. We managed to squeeze in a few minutes to go to the beach. We were not prepared to swim though, so we just took photos. Mamburao is a coastal town and there are lots of good choices. There are resorts but none though that serve food, as this cater mostly to locals. Mamburao's OTOP or One Town One Product are pickled fruits and vegetables. We got to try the pickled bitter gourd or ampalaya and garlic stems at Abdala Store. Since one of my favorites are bamboo shoots or labong, I got a bottle for P 120.00. Mamburao also makes patis and bagoong. By the way, when in Mamburao, stay at Maru's. 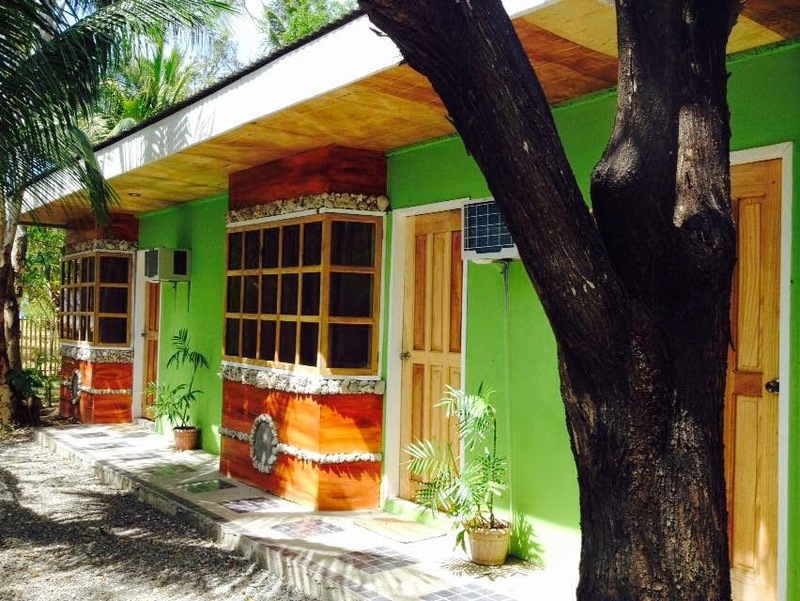 They have good food, spacious rooms and it is a few steps away from the beach. The beach is not for swimming though but more for relaxing walks and watching the sunset. The owner is Ms. Elma Tejada, former tourism officer of Mamburao. She and her family are very nice and they know how to entertain guests. Y They can share lots of good stories about Mamburao when they are not too busy. Try their drink called Perk and their Chicken Fricassee. Instead of heading back to Manila on our third day, we decided to drop by Puerto Galera for our side trip. We missed the regular boat trip to Puerto Galera, which leaves at 12nn, so we rented this small boat for two thousand pesos. I really thought we would not make it but we did, and we did get to appreciate more of Mindoro's coastline. 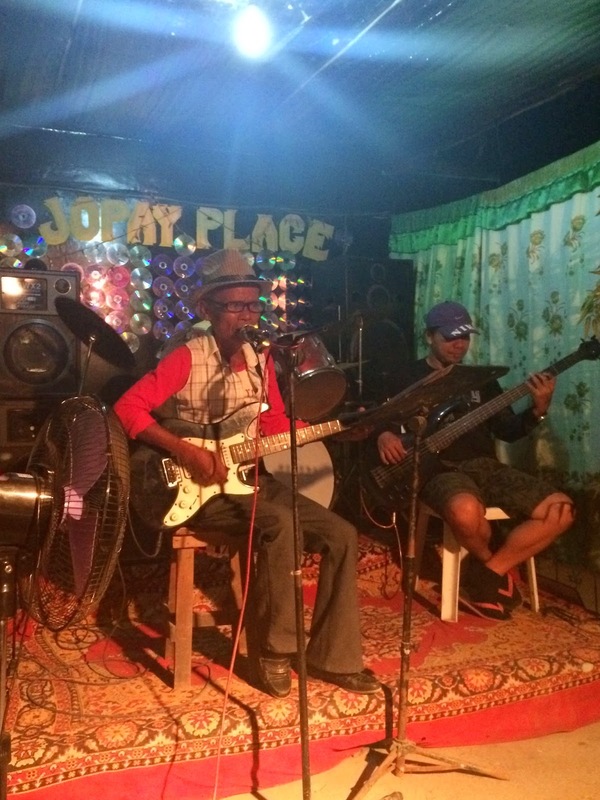 Good food and music continued in Puerto Galera. We were lucky The Brasspackers, a group of students from France, were there. We first saw them in Zambales and we got a chance to watch them perform again in Puerto Galera. We just relaxed on our second day at the beach. We took the 2PM boat back to Batangas City and we were home before night time. Thank you very much to the local government of Mamburao for inviting us to the Tuna-tunelada festival. Thank you very much to the people of Mamburao, most especially to our very gracious host, Ms. Elma Tejada. Thank you very much also to Mr. Randy Urlanda, Mr. Robert Evarola and the rest of the media team who covered the festival. Thank you also to Mayor Ed Gadiano for treating us to dinner. Before I end this, let me just say that I truly admire the people of Mamburao and Sablayan for choosing sustainable fishing over other methods. I thank God you were not lured by easy money. The rest of the country and its future generations owe a lot to you. Thank you!